The Android Root - Risks and Benefits! Home » The Android Root – Risks and Benefits! 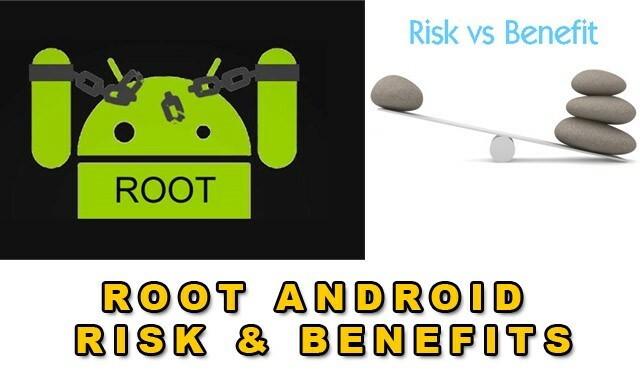 The Android Root – Risks and Benefits! What is root, by the way? Rooting simply allows you to access the phone with administrator rights. By downloading a small Linux software named “su”, you become a “Super-User” which means you can set almost everything on your smartphone. To better explain, Android root is the equivalent of an iOS unlock. The root widens the capabilities of your Android device, allowing you to install any application and perform all kinds of commands normally inaccessible to users. For example, you can clear your phone’s cache memory or use your device as an attached modem, a method called tethering. With a “root” phone you have the option of installing software that you might not otherwise get. Some very useful applications require root to work. Titanium Backup , for example, is an application that using root permissions allows you to back up and protect all the data on your phone. Other applications like AdFree , a software that blocks the banner ads embedded in applications installed on your Android, are only available for rooted phones. In addition it is not possible to make a screenshot on most Android smartphones without performing the root. Is it dangerous? Would I lose the warranty on my phone? What are the risks? Indeed, root is a rather dangerous manipulation that involves risks. In almost all cases, root will void your phone’s warranty automatically because manufacturers absolutely do not want users to have access to the secret commands on their devices. It is nevertheless true that in tinkering with system files, you risk sabotaging your smartphone for good. Although it is possible in general to undo most of the mistakes commit it is not very easy. It should not be forgotten that the majority of the operators and the manufacturers do not authorize the modification of the official software. Pay attention to the applications you install on your rooted phone. Read all user reviews carefully and be careful to browse through all permissions before downloading a shady application. Will I still receive updates from my operator? Perhaps. Most updates are designed to work with the original software and will not communicate with your root version. The only recommended solution is to try to undo the root, perform the necessary updates and “reroot” your phone. Can I “roll” my phone? It depends on your phone. Some devices are very easy to root, but with others, it is a real puzzle. So it is extremely important to take the root seriously and do a search on the model of your smartphone. If you are knowledgeable about the subject, a root will allow you to have more control over your smartphone. In any case, as with everything, there are as many risks as advantages, but in the end, it is up to you to decide!